This high impact ad unit is similar to a pop-up ad, except it appears in the same window as the regular site content (many pop-up ads open in a new tab or even in a new window). 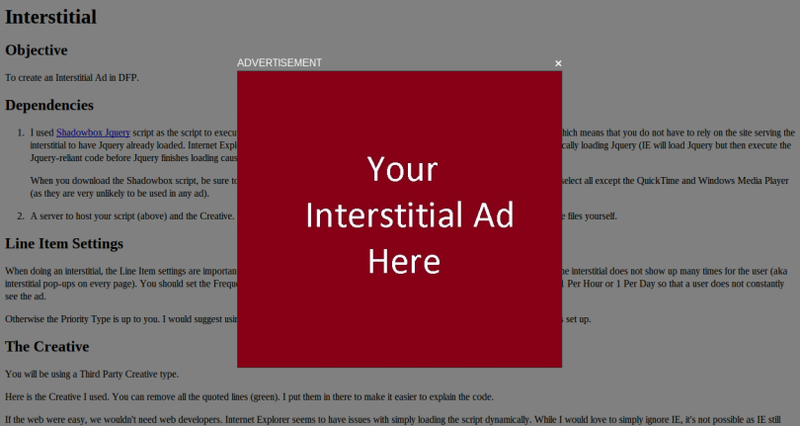 Because interstitial ads open in the same window as the site content, they won’t be impacted by pop-up blockers. Interstitials are high impact ad units, and should generally only be used in special situations. 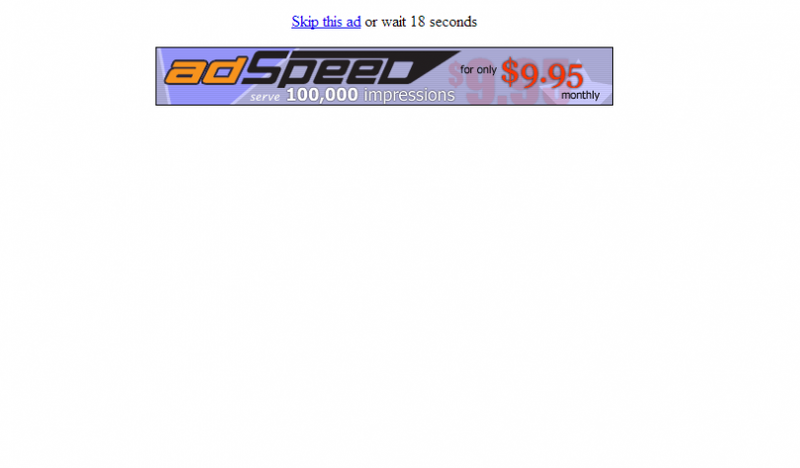 This ad implementation is primarily relevant for sites that are monetizing by selling directly to advertisers. Many CPC ad networks, including Google AdSense, prohibit partners from serving their ads in any sort of pop-up mechanism. Because the interstitial ad results in a disruption of content consumption, this ad unit must be frequency capped. In other words, many visitors to your site will be willing to put up with an interstitial ad occasionally covering up the content, especially if the ad is relevant and your site provides high quality content. However, even the most loyal of visitors will likely get annoyed if these ads begin appear multiple times during a visit. It is also advisable to avoid showing interstitial ads on the very first page viewed during a session; that initial impression may drive away visitors who would have otherwise engaged with multiple pages on your site. For example, a publisher may set up an interstitial to run on the fifth page viewed by a visitor, and to only show one interstitial per week. Interstitial ad units require additional time to set up properly, and can have adverse impacts on some user experiences. As such, publishers should be compensated with rates above standard ad units. Finally, it is worth noting that some advertisers may prefer not to have their ads appear as interstitials despite the higher visibility and click rates. Advertisers may be worried about associating their brand with an ad implementation that some visitors will deem to be annoying or invasive. As such, publishers should generally only include advertisers who have specifically approved this type of ad unit. Interstitials are similar to some other high impact ad units, including pop-ups and welcome ads.